Sky Sports is the premium sports channel in the UK and if you’ve tried to watch it abroad you’ll know it’s blocked. In this guide we’re going to show you the simple way you can unblock it and watch from anywhere in the world. One of the strangest things about Sky Sports is even though it is a premium subscription channel that can be accessed via TV or online, it is impossible to access when you’re outside the UK. It’s a bit of an odd situation considering you pay a premium for these channels and as such should be able to access them no matter where you are in the world. If you’re away travelling on holiday, business or even as an expat we’re going to show you by using a simple app called a VPN how you can access your Sky Sports account and watch wherever you are in the world. To access the Sky Sports site when you’re outside the UK you need a system that can disguise your online location, or at least make it appear as if you’re in the UK. The best way to do this is to sign up for a service called a VPN or Virtual Private Network to give it its full name. A VPN is a system designed to protect your privacy online, they are totally legal and are used the world over to safeguard users’ internet access by encrypting their connection. Once you’ve signed up and connected you can pretty much choose to appear as if you’re anywhere in the world. Just follow the step-by-step instructions below to watch Sky Sports abroad. 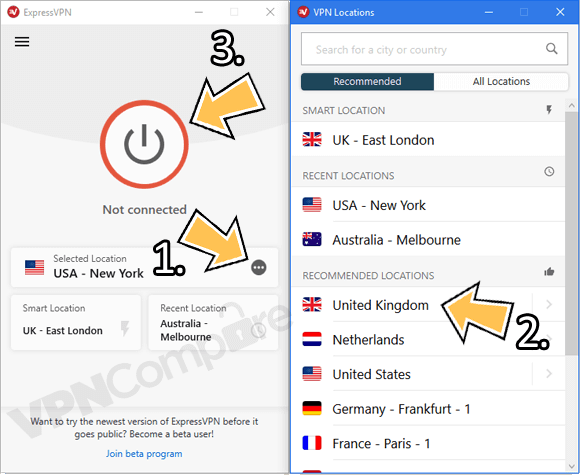 Sign up to the VPN provider ExpressVPN. Download their app from your app store or their software from their website. 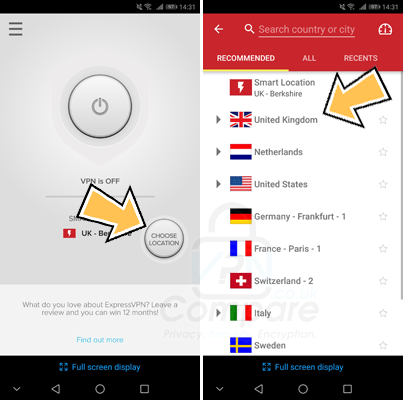 On the app or software select Choose Location and then United Kingdom. After about 15 seconds the app or software will make connection. You can now visit the Sky Sports website and rather than be blocked you’ll be able to watch all your favourite sport. With online streaming you need to sign up to a quality VPN provider who should cost no more than US$5-10 per month which is roughly £3-6. There are plenty of other good providers although not all work with Sky Sports so if you opt to choose one of the other providers from our VPN Comparison Guide then be sure to ask in advance if their service is working with Sky Sports. If you think it’s going to be too difficult or you’re struggling to find the correct option then take a look at the examples below. Install the ExpressVPN app from either the Google Play Store, Apple App Store or Amazon App Store. Press Choose Location and then press United Kingdom. Download the software from the “Products” section of the ExpressVPN website. Install it and run it. Login when required. Press Choose Location and then select United Kingdom. Watch Sky Sports on your computer with ExpressVPN. Sky Sports have the rights to stream events inside the UK and even though you may reside in the UK the majority of the time there are some who access Sky Sports unofficially in countries outside the UK. These are the types of “customers” who have never lived in the UK or have left permanently and is the major reason why they restrict access to the internet streams outside of the UK. The actual technical reason behind why you can’t access Sky Sports abroad is because of your IP address. Your IP address is similar to a phone number in that it is a unique identifier for your internet connection. Just like the area code of a phone number it can give away the location of the owner, your IP address gives away the location you are currently at. This will be at the very least to the country you’re in and in the majority of cases it will narrow down to an area of the country. With this information alone it is enough for the online streaming site of Sky Sports to block you from viewing further. A VPN alters your IP Address so you appear in another country, in the case of watching Sky Sports it helps you appear in the UK even though you’re in another country. Ready to watch Sky Sports abroad? Save 49% today! Looking for similar articles, why not take a look at these?